We provide fair, honest, heating and cooling repair and replacement for your home or commercial location. We are proud to employ some of the most highly trained, professional, and state licensed electrical technicians in Michigan. The cornerstone of a great business is excellent customer service. We want you to feel confident with your HVAC system. Fralick & Sons provides industry leading HVAC systems manufaftured by Amana. Allows us to match the perfect system to your location. Amana – Lasts & Lasts & Lasts. Generations of homeowners have trusted the Amana® brand for heating and cooling systems that Lasts and Lasts and Lasts®. Today, everyone associated with the Amana brand is proud of that history, and we remain true to our principles of integrity and dependability. We’re committed to a job well done – and it shows. 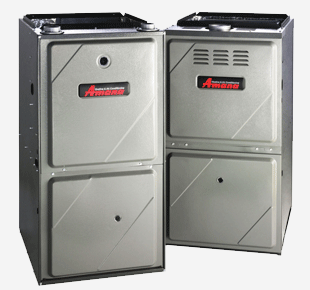 The renowned quality, durability, and performance of today’s Amana brand heating and cooling systems continue to provide homeowners and businesses with premium, lasting comfort. Just as they’ve always done. And always will do. Comfort you can count on. Looking for a company that provides honest, fair heating and cooling repair and replacement in the Genesee County Michigan area? Fralick & Sons provides the service you’re seeking around the clock; from AC repair to heating repair every day of the week. Our certified technicians work hard 24/7 to keep your HVAC system working to create a comfortable climate in your home. Not only do we have a staff of highly qualified technicians, they also provide unparalleled customer service. When you need an experts, Fralick & Sons is here and ready to help with AC repair, heating repair and more. We also recognize that our customers want to feel confident depending on their HVAC system. At Fralick and Sons we know that the cornerstone of a great business is excellent customer service. We provide top-notch systems manufactured by Amana. 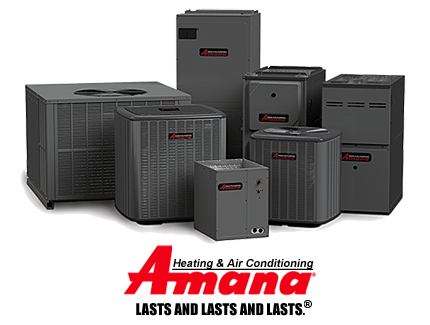 As a Amana authorized dealer, we have the ability to make sure that your new system is a perfect match for your home. Fralick & Sons, Inc. Heating and Cooling is located in Swartz Creek Michigan, we serve our community and the entire Genesee County area to service your heating and air conditioning repair, replacement and installation needs. Get the heating and air conditioning service you deserve by calling Fralick & Sons, Inc. Heating and Cooling today at (810) 659-2160. Maintenance & Service you can trust. At Fralick & Sons we truly care about what we do. Our company works hard to offer our clients with the highest degree of service and expertise. Our dedication to your satisfaction delivers the most complete and lasting comfort solutions for your home or business. When winter arrives you want to make sure your heating unit is properly installed and functional. Call us for estimates, repairs, service and installation. When the temperature rises outside you want to be cool and comfortable inside. You can count on our staff properly repairing, installing and maintaining your unit. Make sure you have nice hot water during the cold season. We offer installation and repair, as well as provide quality customer service every time. Amana's line of leading comfort equipment has a capacity, efficiency and price that will suit your all of your needs. With harsh winters and blazing summers in our area, it is so important to regularly perform maintenance to your home system. When you need immediate service, our technicians can quickly and effectively diagnose and repair your system to it's maximum performance. We can help you with upgrades like adding outlets, updating wiring, and improving efficiency to help lower your monthly electric bill while keeping your home safe & secure. Michigan winters are as fierce as ever, let us ensure your power stays on and you stay warm. House surge protector can extend the life of your home’s valuable electronics, saving you money in the long run. We install all outlets/switches, complete home panel replacement and upgrade, new lines from panel, large appliances, outdoor entertainment and lighting and more. 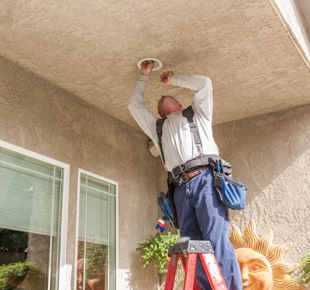 Our skilled technicians are trained in both installation and repair of outdoor lighting packages and are ready to come by for a consultation anytime. Our professional installation can assist with any type of home appliance quickly and easily. We have years of experience with all makes and models found in the industry. I want to thank you for a very fine job. You and your crew has done everything just fine. Your men are on time in the morning, courteous and do a good job. Thank you. This letter is to thank you for a job well done, outstanding cooperation and extra efforts during the course of the entire Air Conditioning Construction Phase. My air conditioner went out this past Saturday during my night shift weekend of work. I called Fralick & Sons Monday morning and they had someone out there before 2pm. The technician Rich was amazing. He answered many questions. He told me what I needed to hear not what I wanted to hear. Copyright 2019. All Rights Reserved Fralick & Sons Inc.